Two Mistral helicopter carriers could end up costing France as much as €5 billion if it fails to deliver them to Russia, according to a French magazine. Paris and Moscow are also now locked in a dispute about how much compensation should be paid. An article in the Le Point weekly magazine states that if Paris falls back on its promise to give the two vessels to Moscow, the French government could end up having to pay an overall cost of up to €5 billion ($5.7 billion), if it does not fulfill its contractual obligations. “Instead of bringing the French ship building cooperation DCNS a profit of €1.2 billion and those involved in the construction €980 million, the cancellation of the deal could cost France between €2 billion and €5 billion,” the article stated. The magazine says that talks are ongoing between the respective French and Russian parties, although, “significant differences in regards to the amount of compensation exist.” The publication adds that “France is now looking to return Russia less than the €890 million that Moscow has already paid” for the vessels. 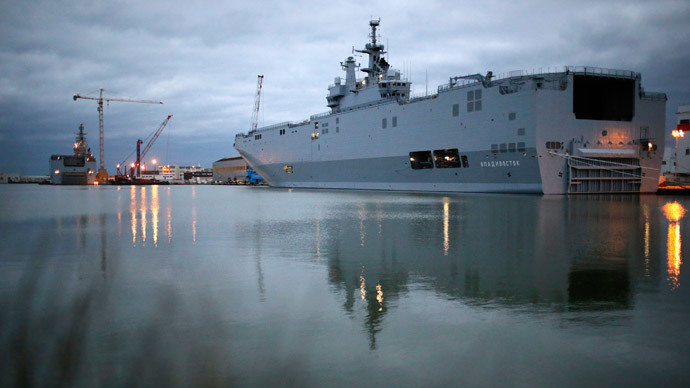 Last week, Russia’s Deputy Prime Minister Dmitry Rogozin ruled out allowing Paris to sell the Mistral warships to a third party without Moscow’s go-ahead. “Without our permission they can’t sell anything,” he said. Rogozin added he had already explained the situation to the French, while Russia has an end-user certificate for the stern parts of the vessels. The stern parts of the helicopter carriers were built at a shipyard in St. Petersburg before being moved to France for further assembly, he explained. France will also be unable to use the Mistral vessels as part of their fleet because the warships were built to meet the Russian Navy’s specifications, Rogozin also stressed. In late April, the French President Francois Hollande acknowledged that Russia should get a refund if it doesn’t receive the Mistral ships. The Mistral helicopter carriers have been causing the French government quite a headache since Hollande, under pressure from the US and the EU, postponed delivery of the vessels last year indefinitely, due to the accession of Crimea and Russia’s alleged involvement in the Ukrainian conflict. In May the situation involving the state-of-the-art ships became so bad that a French newspaper reported that Hollande’s government was even considering scuttling the warships if the contract was canceled. An article in Le Figaro on May 6 said Paris may have to resort to sinking the helicopter carriers if the government refuses to honor the contract and deliver them to Russia. The first vessel, the Vladivostok, should have been handed over in November 2014. Jean-Pierre Thomas, a former adviser to ex-President Nikolas Sarkozy, told RT than any decision to sink such costly ships would be absurd. “It would be completely nonsense. We will lose employment for 1,000 workers at Saint-Lazare, which are building these two ships. France will lose money and lose employment, that’s the business part. The second loss is the image. The Mistrals have to be delivered; it has to be mixed with diplomacy. Politics and diplomacy is one thing and business is another thing,” he said. The contract to build two Mistral class amphibious ships was signed between Russia and France in 2011. The Vladivostok was launched in 2013 and the second, the Sevastopol, is planned to be completed in 2015.